In the "Mixer Device" section, select the name of your sound card or other audio device (e.g. USB headset or mic). In the "Adjust Volume for" section, click "Recording." In the "Show the following volume controls" section, be sure that the audio input device you want to use with Auracle (usually "Mic") is checked. Click the "Select" checkbox for the audio input device you want to use with Auracle (usually "Mic"). Move the Volume slider for that audio input device towards the top. Auracle should now hear your voice! 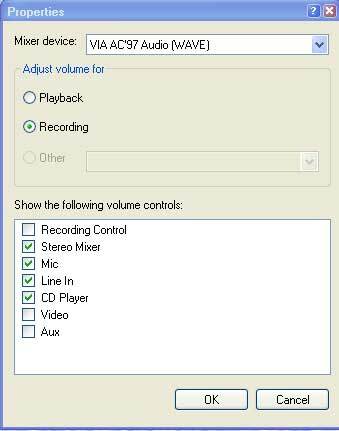 Even if you see "Mic" listed in the Volume Control application, your PC may not have a built-in Mic and you will need to use an external mic with Auracle. The "Mic" is often just a port on your computer where you can plug in an external mic. Move both the "Volume Control" slider as well as the "Wave" sliders towards the top. 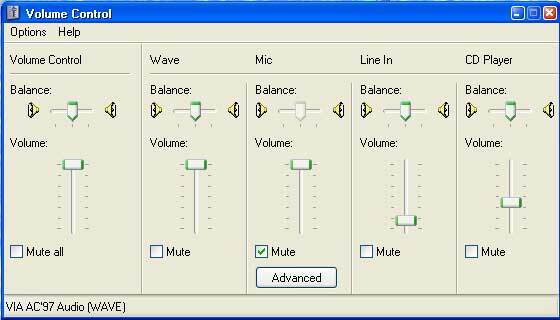 Be sure that "Mute all" under "Volume Control" and "Mute" under "Wave" are unchecked. The current audio device is listed at the bottom of the window. (In the screenshot above, it is a VIA AC'97.) 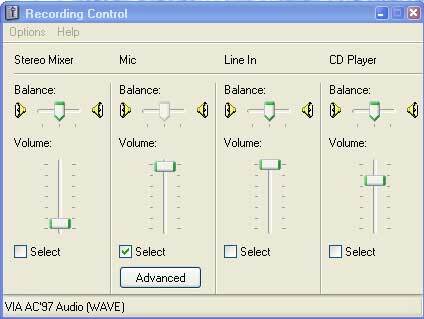 If you want Auracle to output audio to different audio device, then click "Properties" in the "Options" menu, select the device from the "Mixer Device" popup menu, and click OK.
We recommend purchasing a USB headset for use with Auracle. You can easily find a USB headset at your favorite local or online computer store.